Inner Journey to Buried Love. How to Love Yourself? Inner Journey Diary Blogs. Questions about love. How to love yourself and others? How to reach buried love? Blog journals on healing emotions. Inner Journey Diary Blogs. Questions about love. How to love yourself and others? How to reach buried love? Blog journals on healing emotions. #7 ... I'm not saying this is the best equipment. I am saying it's been doing more than anything else has managed to do for me. In stories, often adventures happen. The hero or heroine doesn't know what will happen next. Alice falls into Wonderland, meets one magical creature after another. Sinbad the Sailor learns magic words and treasure is revealed. In stories, ogres and other horrible monsters threaten death. Love beckons - and sometimes false love is a horrific trap. In this story, over the past 8 months, I've been on a roller coaster ride - some of it to do with outside stuff. But much to do with what's happening within. So the outside world could stay unchanged - and I might feel fine about it, I might fall into a week of deep grief, I might be in a gray zone. The big thing - as with the physical journey I took last fall - I don't quite know where I will be going next. Last fall, I knew: next is, say, Cape Breton Island. But what exactly will I find there? Where will I stop? What will I see? Whom will I meet? And how will I feel about all that? No idea. On this journey, I knew: I will use whatever tools I have to get further, to deal with whatever is emerging. I also knew - unlike when on the journey last fall - that there were some things I really wanted to reach, and that reaching them could bring much. Last fall, though I felt like driving along, say, the Bay of Fundy, it hardly mattered what I saw. And I used no special tools - just a car that drove. This time, I have much less sense of choosing where I'm going. And I know that, while the journey matters, the destination counts enormously. Maybe it's a bit like an Easter egg hunt. I've been finding - or rather, mainly discarding - lots. But there is a big prize, a part of myself, I'm supposed to be able to join with, take with me in the deepest way possible. Some of the tools - EFT - have given mainly ways to get rid of some of the briars blocking the way, some of the sand that's covered the prize. The Taoist exercises have dome more of the same - clearing. And also they've been building inner connections. 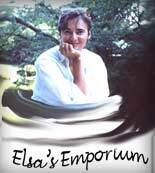 Click here for all of Elsa's diary blogs. How to love yourself and others? How to reach buried love? 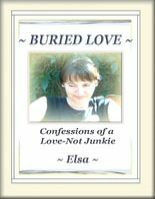 Elsa's Diary Blogs with Questions about Love, like How to Love Yourself?